The things I learned from O — and on a cruise, no less. Vivian Vassos sets sail on a journey of discovery. It’s only the first day of the cruise, and O already has me in tears. Angela Davis – not the political activist but the Olympian – a member of O’s battalion of experts whom she deploys to teach, motivate and mentor her flock, is on the Eurodam’s theatre stage, getting the packed house up on its feet, spurring us to move while spouting encouraging words. I’m pushing, along with just about everyone else, even though it’s about 8:30 a.m. and I’m craving a caffeine fix. At first, I’m loath to get out of my chair, worried I’ll hit the person next to me with my flailing arms. Eh, what the hell. I’ll give it a try. To my amazement, I haven’t slapped anyone in my vicinity and I’m still able to focus on Davis, her movements and her intentions. Wow. Okay. That just about broke me. As I’m moving, I feel a release. Are those tears on my cheeks? Could the mix of physical and inspirational be breaking through? I’m not alone. There’s not an eye roll in the house. People are smiling, moving and, yes, some are crying. Not in a bad way, mind you. More like a soft expulsion of focused energy. Suddenly, it’s over. Angela Davis, star athlete, motivational speaker, a member of Oprah Winfrey’s SuperSoul 100 trailblazers, has me breathing hard – and thinking. If the goal of this cruise program is, as the powers that be at the Holland America cruise line (HAL) told me, to unite “the soul-stirring power of travel with O Magazine’s deep commitment to connection and personal growth,” it’s certainly working, with most of HAL’s sailings from North America now featuring O-inspired activities. Over a week, the magazine and elements of OWN, the network Oprah founded, come to life on the ship, with the hit SuperSoul Sunday television content leading the way. Then there’s morning guided meditation; more SuperSoul 100 lecturers, style and dressing sessions, diet and nutrition advice and, of course, Oprah’s book club, where some of her selected books and authors are on board. And if you need a break from the all the motivational stuff, you can still get a bit of personal growth through cooking classes at America’s Test Kitchen, a HAL highlight. While on board, how to make Curry Devilled Eggs was on the menu. Go to www.everything zoomer.com/recipe-devilled-eggs for the delightfully old school recipe. Speaking of old school, Davis’s message seems simple and, sure, we’ve heard a lot of this before. Tried is true, I guess, and before she lets us go, Davis invites Gayle King, editor-at-large of O Magazine and O’s right-hand pal, on stage. “Angela, a soul cycle class with you is a religious experience!” King says in return. It’s a profound moment, she adds, where there’s this connection between the physicality and the emotion. I’m not sure if that’s exactly what I experienced, but, yes, it was a profound moment for me. I’m so excited I burst into the stateroom where my travel colleague is waiting for me and start reciting Angela bon mots. “It’s about sanity! We should be living the life we were created for!” Sanity, maybe, but he’s looking at me like I’m nuts. He, as a travel industry veteran who works with luxury travel agencies and a like-minded and trusted friend with whom I sometimes trek, gently reminds me that as a writer and magazine editor who is also passionate about travel, one of my roles is to tell stories about the journey. In other words, I am sort of living the life I was created for. Another profound moment – provided not from a guru this time but from a friend. I say a quiet thank you for him to the universe and push my intentions out there. And what was in front of me? Alaska – for my first time. The voyage would take us via the Pacific, up the Outside Passage from Seattle along the west coast of British Columbia and northward. “Let it go, let it go out to sea …” more inspiring words from lectures I’d attended, come back to me. The meditative back-and-forth of the ocean has an effect, an ebb and flow that makes me feel like I’m moving forward in more than just riding the ship carving a path through the waves. It’s nearly one year to the day after my divorce was finalized – a milestone I hadn’t realized until now that I was mentally marking. It’s a new frontier for me. And frontier, it is. Juneau, Sitka, Ketchikan. Tiny towns almost enshrouded in great evergreen forests, welcoming people who take the ship’s behemoth portside shadow in stride and, the most magical of all: the stretches of the ocean’s surface, only broken by gulls dipping and diving for the day’s catch, seal flippers shining in the sun and the awesome sight of breaching whales. It’s amazing, too, how the greatness of nature can have a quietening, humbling effect – as powerful as the words of wisdom we’ve been exposed to all week. 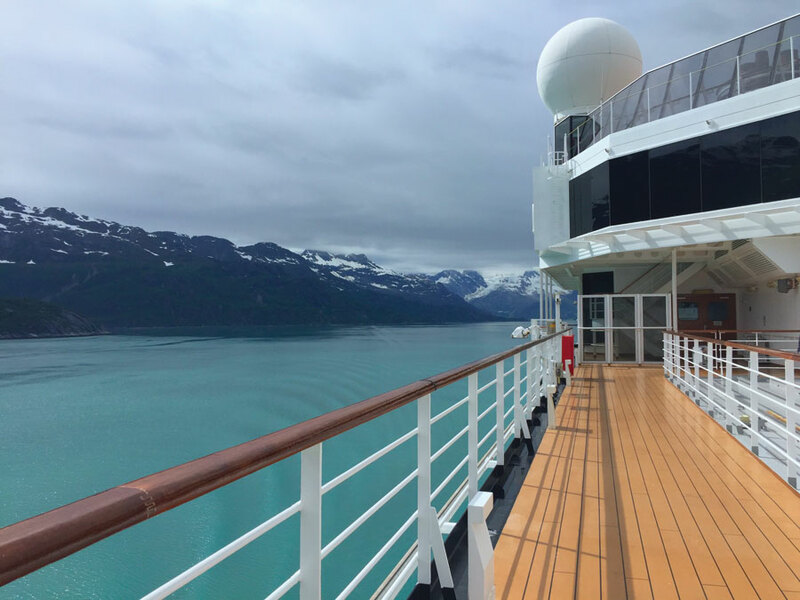 When the ship switches from the Pacific to Alaska’s Inside Passage and navigates the coastline’s fiords, there seems to be a collective inhale. We enter Glacier Bay, a 450-plus metre-deep fiord, part of the eponymous national park and a preserve that’s home to humpback whales and puffins. Everything is still, and the captain cuts back on the engines. 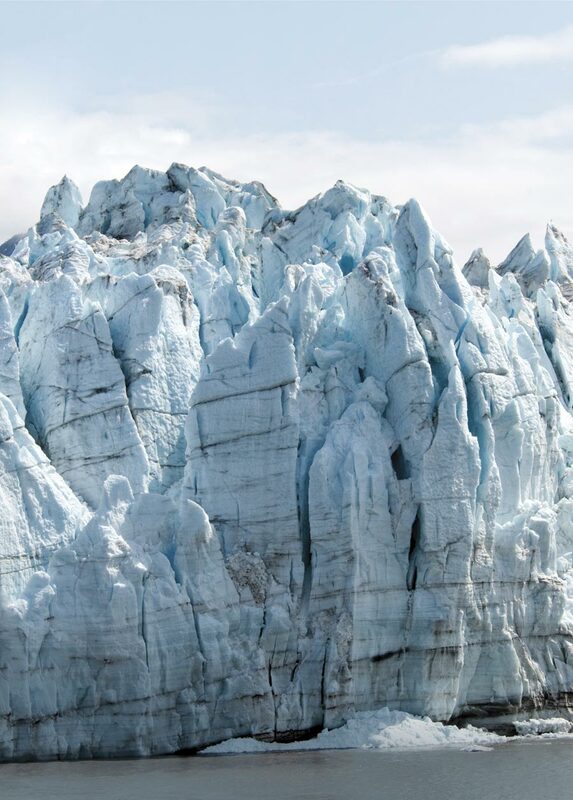 We’re surrounded – floating in icy-blue waters kept at bay by massive icy-blue walls of glacial ice, standing between us and the icy-blue-tinged peaks of the mountains in the distance. In between sits a rainforest. Huna Tinglit elders, the native nation in these parts, tell of an ancient homeland buried by the advancing ice. A northern Atlantis of sorts. The hush is broken when someone spots a whale. It’s a humpback, going for a swim in the early afternoon sun. She rolls, surfaces, spouts a spray and sinks slowly, allowing the sun to reflect off her slick back. She comes up again and this time dives, flashing her tail, and then she’s gone, barely leaving a ripple. Awe. Silence. Collective exhale. When Oprah was a child, her grandmother, who raised her, gave her a Bible, and it was with it she learned to read, being the only book they could afford. By the time she was five, she was reading the gospels in church. She was also miles ahead at school. “We were asked to write down words we knew how to spell,” she tells her fans in the filled-to-capacity theatre. She wrote down, mostly words from the Bible, the names of some of its books and the word hippopotamus. At five years of age. “They didn’t believe me,” she says. The point being that throughout her early life and career, a lot of people didn’t believe Oprah or believe in her. But she didn’t give up. Her past of living in poverty and abuse is well-documented; her hard-won rise above it legend, giving her a power that has led to her stratosphere. Stand unashamed in your truth is her message. Oprah’s a wonderful storyteller; inspiring in the way she has manifested that message. And many of my fellow cruisers need this. Or, at least, they believe they need to hear it. Is it redemption? Absolution? Can a little bit of that O magic dust rub off? Oprah’s path is inspiring, true, and she is blessed with an ability to create her own opportunities. I, in turn, have been blessed with a fair amount of self-confidence, so I’m good. But this daily affirmation does create a bridge between what Oprah has managed to do in her life – astute media mogul, award-winning actor and Hollywood producer as well as savvy political power broker (remember Barry who? from Chicago?) and what these cruise goers can aspire to in their own. Yes, Oprah’s still all about making it happen for yourself, without laying blame or responsibility on someone else. Like her magazine – and even like this magazine you’re reading – it’s all about access and sharing; access to experts in the fields that currently make the biggest impact, whether it be wellness, weight, self-help or spiritual guidance, with hers being laser-focused on the self-esteem and self-confidence-seeking. I’m still on Weight Watchers,” Oprah tells us, her painful struggle with her weight often reported. “But I like my tequila. And I know a shot of tequila is two points!” She’s not too preachy but she does delve into spiritual territory. Her faith is part of her reality, just like her weight and her love of tequila. But that’s the appeal of Oprah (and O). She still comes across as slightly imperfect and, yes, real – a well-manicured, just-out-of-our-reach real but imperfectly real, nevertheless. 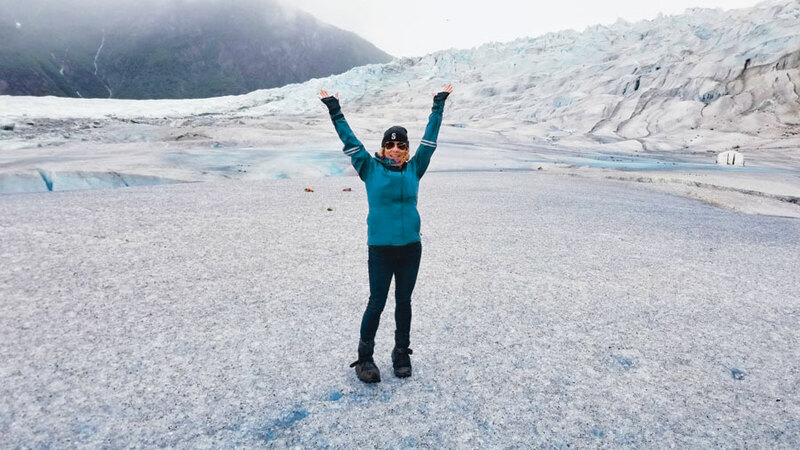 Spurred by her words, my cruising companion and I board a helicopter near Juneau for an aerial view of Mendenhall Glacier – and to land on it. After strapping our feet into special glacier-trekking boots and bracing ourselves to the cold, we hop out. Onto solid ice – all 21 kilometres of it. Pale blue and white converge to create a pastel confection, at first like cotton candy to the eye, but as hard as stone to our soles. Our guide spies a break in the glacier, where a stream is gently flowing. I look at my friend and, in a moment of impulsive joy, we get down on our tummies and stick our faces in the water, taking gulps of what could be the freshest taste I’ve ever experienced. We burst into laughter, my cheeks wet, this time not from tears but from the icy fresh glacial water. “Life is always better when shared,” Oprah had said to us just the day before. The gospel, according to O.